I'm back with another fabulous picture book to add to the lovely SusannaLeonard Hill's Perfect Picture Book Friday project. And considering the extremely cold weather in my part of the world today (and the fact that my kids have a snow day off of school today! ), I think I picked a good/appropriate one for this particular week! of silver snowflakes in the air." Synopsis: How do the robot children of Clackentown spend snow days? They have supersonic snowball fights, make robot angels with wing nuts moving up and down, take hot oil baths to thaw out the joints, and receive eskimo kisses on metal noses at bedtime. 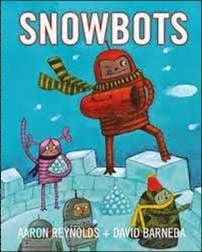 Author Aaron Reynolds and illustrator David Barneda team up to tell a hilarious story about two favorite subjects—robots and snow days! Resources: There are several websites with ideas for keeping your kids occupied during snow days. Here is one. Another one is here. And another here. This is perfect for so many children out of school because of snow. The first thing thing I wondered about robots and water, was rust (Oz). But, I loved how they take hot oil baths to work out the joints. Very clever story that will delight many kids. I agree - definitely a clever and fun one! Thanks for stopping by, Patricia! I have to agree, Joanne - what could be a better combination than snow and robots? :) This sounds very fun! Thanks, Susanna! Fun is definitely the right word for this one. I wouldn't think that snow and robots would make a good combination?! But sounds like the author has worked it out nicely! I'll have to check this one out! Thanks! I hope you enjoy it! Appreciate you stopping by! What a fun book. I'm sharing this with a friend right now. It really is - I hope your friend likes it! Thanks for stopping by, Stacy! Thanks Clara - hope you enjoy it! Wow, this looks hilarious! I will have to look for this one at my library. It really is, Carrie - and sweet too. Thanks for stopping by. Hope you like it! this book looks like one my kids would have read over and over again when they were that age. Snowbots! Why didn't I think of that! I'm sure my son would have too, Sue. Thanks for stopping by!